"Adam Diegel lent his rich Italianate tenor to a transfixing duet with her and made a second-act aria of desperate love deeply involving"
"The most famous solo part in Verdi’s Requiem is the “Ingemisco,” assigned to the tenor, and here, and throughout the work, Diegel’s strength and purity of his singing, as, seemingly without effort, he produced a flood of golden tone"
Diegel sang Don José’s customarily lyrical moments with some of the same ardor and edge he showed during his confrontations with Carmen, Zuniga, and Escamillo. Making his local debut, Diegel showed much promise for a wider range of roles. Adam Diegel’s performance as Don José, the soldier who falls in love with Carmen, was captivating and deeply conflicted between the allure of his lover and the responsibility of his station. Diegel’s portrayal of Don José profoundly developed and progressed with the character when he is both loved and betrayed by Carmen, giving a transcendent quality to the development of the character. While everyone loves Butterfly, the role of Pinkerton, the caddish American Navy officer who sees the world as his oyster, is more difficult to pull off because the character is so unappealing. He is meant to represent the American attitude toward other cultures at that time, disrespectful, condescending and utterly self-centered and Diegal portrays him convincingly and has a great tenor voice. Tenor Adam Diegel had the difficult task of trying to show character growth in Act III from the boastful jerk that Lieutenant Pinkerton seems to be in the first act. Diegel was convincing in his remorse, though, his voice sturdy and assured. Adam Diegel, his Pinkerton, deployed a penetrating, highly-placed tenor voice that was riveting to hear. However, the male voice that most intrigued me belonged to tenor Adam Diegel who sang the role of Ismaele, the secret love of an Assyrian princess. He had power, he had ping, and I would surely love to see him in a bigger role like Cavaradossi or Don José very, very soon. "The best singer onstage was tenor Adam Diegel as Ismaele; too bad his role was relatively brief"
"Fluid tenor Adam Diegel turns in a robust performance as the valiant Ismaele"
"It should first of all mention the magnificent performance of Adam Diegel in Lefebvre, through a broad and powerful voice (in the first act, only his voice was fully audible above the orchestra), comfortable in all tessitura, and with a compelling sense of drama"
"American tenor Adam Diegel's portrayal of the rejected Don Jose was intensely powerful"
The American Adam Diegel as José, tall and sturdy, looked the part of Carmen's latest love victim and conveyed perfectly the pent-up anger of a feckless man who – we know from the original Merimée novel, but not the libretto – has already committed a murder.....Diegel rose to the challenges of Acts III and IV. "Adam Diegel, in his Arizona Opera debut, was an exception. His youthful, powerful Pinkerton was outstanding with a tenor strength and quality to fill the house with those beautiful, memorable Puccini melodies." "Opposite Shu-Ying Li is tenor Adam Diegel. His clarion, lyric voice has a sparkling timbre and the portrayal of the thoughtless American officer meets the expectations of the part. He sings the Act 1 love duet with sincerity and commitment. One of the best musical moments of the evening." "In the first two acts, Adam Diegel was a stolid Don José, but he brought a passionate demeanor to the final duet; here, too, his tenor acquired a new measure of forward thrust." Adam Diegel, a towering, solid man, sings the role with extreme gusto. His piercingly smooth voice fills the Alice Busch Opera Theater. Pacing himself rather well in this tiring role, he gives a riveting performance"
"American tenor Adam Diegel sang Ismaele, who fallls in love with Fenena and converts her to Judaism. Here again was a strong, heroic, powerful tenor; it’s a shame Verdi didn’t write more for Ismaele to sing. Diegel’s lyric sound is a delight to hear." "The gleaming, virile tenor of Adam Diegel was a highlight of the evening. Diegel, who gave a strong performance as Don José in last season’s Florida Grand Opera production of Carmen, appeared this season as Froh in the Metropolitan Opera’s new production of Das Rheingold. As Ismaele, the member of the Hebrew royal family who betrays his people for love, he brought an intense, muscular voice to his initial duet with Abigaille. Diegel also allowed an effective edge of desperation to creep into his singing as he pleaded with the Hebrews for forgiveness." “Here too was a Pinkerton (Adam Diegel) as innocent as Butterfly, not callous at all, an enthusiastic young puppy. When Butterfly revealed that she was but fifteen, Pinkerton registered surprise, if not shock. New as well was Pinkerton's extreme deference to Sharpless, even if he did not heed the older man's warnings.....While the acting was subtly played, the singing was grand when needed, gently restrained as necessary. (Yunah) Lee and Diegel matched each other note for note, phrase for phrase, both voices mounting and combining in silver-toned ecstasy." "The opera became a showdown between Adam Diegel's impulsive, shaggily handsome Cavaradossi and Lester Lynch's fearsome, animalistic Scarpia...(Diegel's) spacious, Italianate tenor...he delivered a stirring "Recondita armonia" and built "E lucevan le stelle" masterfully from hushed intimacy to an unfettered cri de coeur"
"When Adam Diegel's Don Jose croons that the flower Carmen gave him sustained him during his imprisonment, the words may be melodramatic but Diegel invests them with a passion that slices into the soul." "The role of Don Jose can be a thankless one, elbowed out of the way dramatically by Escamillo and vocally by Carmen. But the tenor Adam Diegel sang the part with such intensity that he gave the role a stature it rarely achieves on stage. Singing with a rapid but tight vibrato that maintained a firm tonal focus, he was particularly strong in his duet with Alvarez, in which he sang of his memories of home, and in La fleur que tu m'avais jetée, where he sings of Carmen's hold over him." "Adam Diegel, offered crisply articulated French and true dramatic-tenor thrust as Don José. His flower song set the stage for José's full submission to Carmen's fatal charms"
"Tenor Diegel exquisitely controls tender moments, but also displays a powerful voice in moments of passion." "Adam Diegel is a lyric tenor of strength and clarity: he ably shows the evolution of Don José's jealous nature." 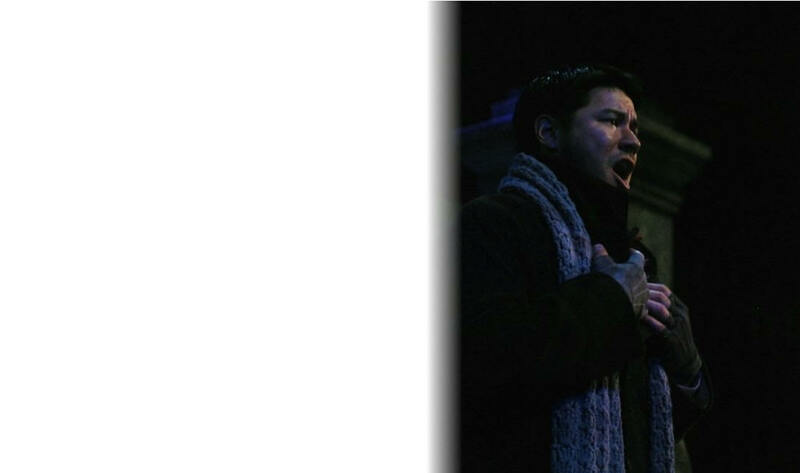 "Adam Diegel (Rodolfo) sang with beautiful Italian diction, flawless intonation and a creamy lyric tenor."